Slots and fruit go hand in hand. 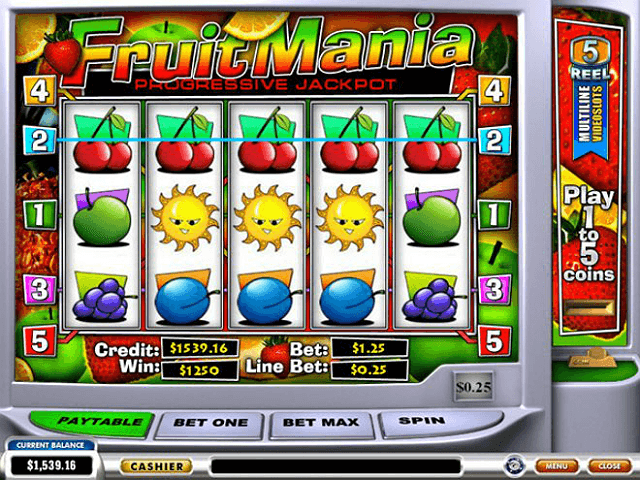 The classic slots of the past nearly always featured fruit, and Fruit Mania from Playtech is a nod to that legacy. Each succulent-looking strawberry, shiny green apple, or zesty yellow lemon is ready to burst with winnings if your luck's in. It's simple enough to get to grips with quickly, even if you're new to online slots. Finally, there's the big one – the progressive jackpot. If you can match all five cherry symbols, the whole pot is yours. Play Fruit Mania for Real Money! Graphically, this slot is uncluttered and effective. The bright, bold colours emphasise a sense of fun, but you can still see all the important information easily. Your bet amount, pay table, and max bet signs are clearly labelled across the bottom of the screen in a contrasting grey. This makes them handy to keep an eye on in between spins. The colour co-ordination of the icons makes it easy to see how the game is going as well, even at glance. 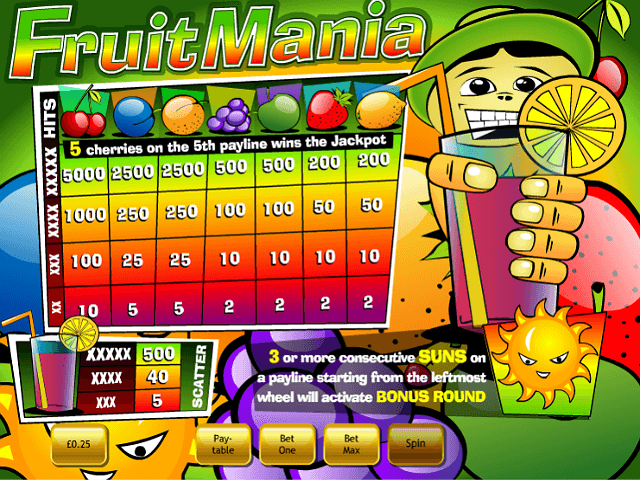 There might be better-looking online slots out there, but Fruit Mania still delivers where it counts (the payout), thanks to its progressive jackpot. There's a Sun Bonus mode you can activate as well, which can give you prizes based on what you pick while it's active. A bit more on this later – but suffice to say that the mischievous-looking sun emblem is a crucial component. You can start spinning with as little as 0.25, and the max bet is 1.25. That means you can end up getting a great bang for your buck if you win, especially when it comes to the progressive jackpot. It's also available on mobile, so perfect for those quick lunch break games (well, it is food-themed, after all). Matching any of the fruits except cherries gives you a standard payout, as you might expect. The five pay-lines and reels give you some pretty good odds for such a low-cost spin, too. The only symbols you need to watch out for are the sun (which activates the bonus mode), the cherries (which can win you the progressive jackpot), and the cocktail glass, which activates the scatter. More on these special features below. 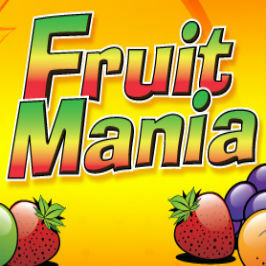 Fruit Mania, like many online slots, has a scatter that can increase your payout by up to a whopping 500 times. As mentioned, the cocktail icon is the scatter, and the payout increases the more you match. Three gives you a times-five payout, four gives you a times-40, and all five nets you the 500. The Sun Bonus is triggered by getting three sun icons on any of the pay-lines. You can then choose one symbol from each of the rows, and these will show you the bonus amount you've won. Line up five cherries and the five figure progressive jackpot is yours! As you can see, despite its fairly simplistic visuals, this online slot is packed with fruity goodness when it comes to payouts and modes. 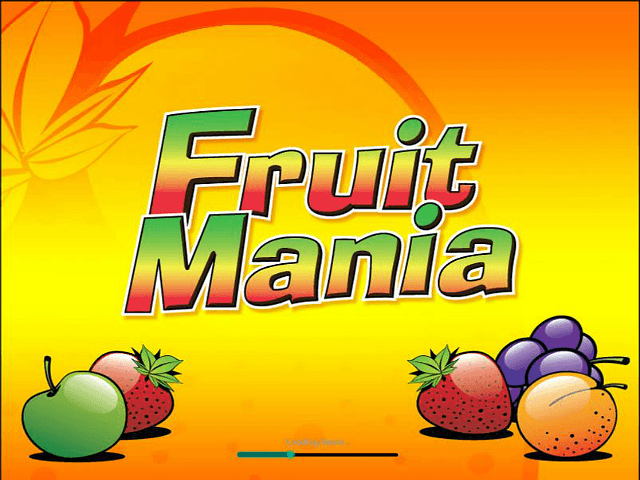 Share this Fruit Mania Review today! 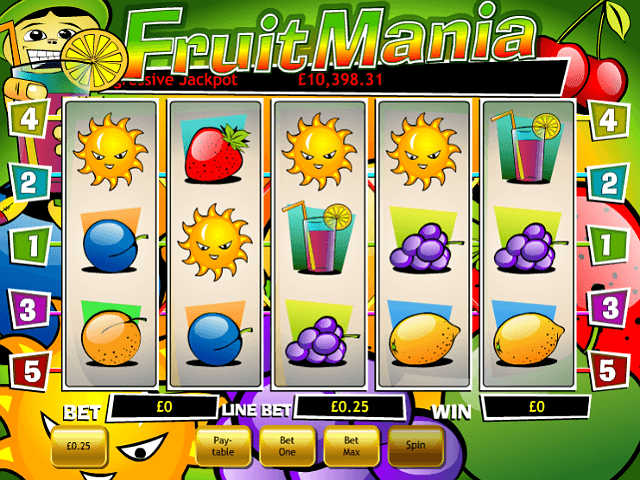 If you like Fruit Mania, you'll love these slot titles too!